Shortly after the release of Avengers: Infinity War, actress Zoe Saldana has received a star on the Hollywood Walk of Fame. The actress is best known for playing the assassin Gamora in the Guardians of the Galaxy franchise and Avengers: Infinity War, in addition to having lead and supporting roles in other science fiction movies like the Star Trek franchise and Avatar. Saldana began her acting career in 1999 when she appeared in two episodes of the popular TV series Law & Order. Saldana's break-out role came in 2003, when she appeared in Pirates of the Caribbean: The Curse of the Black Pearl as the female pirate Anamaria. After that, she went on to land a number of other significant roles, including Uhura in the rebooted Star Trek franchise and Neytiri in Avatar. Saldana is set to return as Neytiri in the next four slated Avatar movies. When receiving her Hollywood Walk of Fame star, the Guardians of the Galaxy actress looked back on her career over the past 19 years. Here is what she had to say. "Having a dream is just step one. Step two: sleeves up, hard work, persistence, passion, perseverance. Fail often and fail forward. If at first, you don't succeed, you dust yourself off and you try again. I learned to love what I do and do what I love and that has been my mantra. From Burger King commercials to Law and Order episodic, to a ballet movie. I got to be a pirate, an INS officer, a xenolinguist on the Enterprise. I got to be an alien warrior - well, multiple alien warriors." Saldana has undoubtedly proven that she deserves her spot on the Walk of Fame, having appeared in a vast number of franchises that have dominated the box office like The Avengers and Pirates of the Caribbean. In addition, the fact that Saldana managed to receive a Walk of Fame Star in under 20 years is rather remarkable. While many celebrities have done it in less, there are a great deal who had to wait decades longer for their star. In fact, Luke Skywalker actor Mark Hamill didn't receive his Walk of Fame star until late last year, despite Star Wars releasing over 40 years ago. 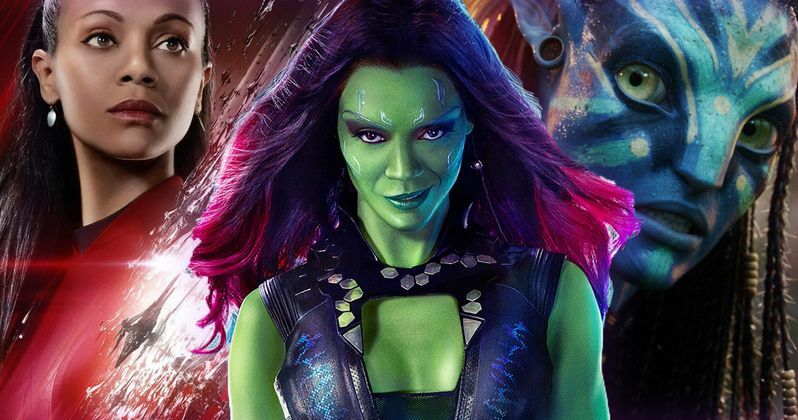 Zoe Saldana now joins other Guardians of the Galaxy stars Chris Pratt, Vin Diesel, Kurt Russell, Sylvester Stallone, and Glenn Close on the Walk of Fame, in addition to a number of other Marvel actors like Paul Rudd, Scarlett Johansson, and Samuel L. Jackson. Many of Saldana's co-stars took to the web to congratulate her on her star. Here is what Chris Pratt had to say on his Instagram. "She's been blue! She's been green! Now she's all gold baby!!! Join me in congratulating [Zoe Saldana] on her star! So proud of you. She was in the biggest movie of all time before it was cool. From Avatar to Infinity War! Keep crushing forever Mama!!" All in all, it's safe to say that Zoe Saldana's success was well deserved. Saldana's steps to her success showed how far she has come as an actress over the past two decades. Saldana never gave up on her dreams, and it has most certainly paid off for her. How Big Is Rocket's Role in Avengers: Endgame?